There are many standing century houses in Dogtown. The Dogtown Historical Society seeks to identify these, document them as century houses and then hopefully to have plaques mounted on these homes. The reason that this project is so important to the history of Dogtown is that the coming of the World's Fair in 1904 brought with it a significant change in Dogtown's history. For those working at and on the Fair, that change came a few years before the Fair itself. Thus we have chosen the nice round numbered year of 1900 to focus on. After that period Dogtown had a population boom that forever changed it. Thus in documenting the century homes in 1900, we turn not only the century, but the millenium. Below are various files which the Century Home Committee of the Dogtown Historical Society have prepared for this project. Fully recognized and verified century homes The homes on these lists have been researched by the Century Home Committee and verified as century homes. 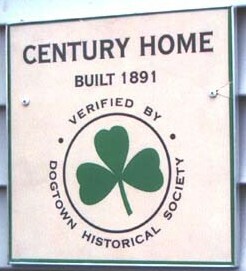 The Dogtown Historical Society has accepted these homes as fully verified century homes. Oldest documented standing home in Dogtown The home at 1527 Tamm Ave., currently owned by Frank Seifred was built by John O'Gorman and has been documented by the Century Home Committee as being built in 1860. O'Gorman family history suggests an earlier date of 1852-54, but this earlier date has not yet been confirmed in city records. List of SUSPECTED century homes These are homes that are listed in the 1900 Federal Census and which, looking at the home at this address today, the home appears as thought it MIGHT be a century home. However, the records of St. Louis City do not support this claim. Either, the city has no records listed for the date of the home, or it lists the home as being built at a later date. These homes will require additional research to gather the necessary data to justify verification. The Century Home Committee A list of the current members and the original members of the Century Home Committee.